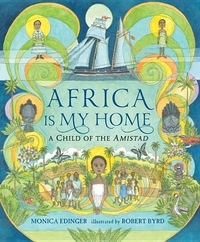 Inspired by a true account, here is the compelling story of a child who arrives in America on the slave ship Amistad --and eventually makes her way home to Africa. When a drought hits her homeland in Sierra Leone, nine-year-old Magulu is sold as a pawn by her father in exchange for rice. But before she can work off her debt, an unthinkable chain of events unfolds: a capture by slave traders; weeks in a dark and airless hold; a landing in Cuba, where she and three other children are sold and taken aboard the Amistad; a mutiny aboard ship; a trial in New Haven that eventually goes all the way to the Supreme Court and is argued in the Africans' favor by John Quincy Adams. Narrated in a remarkable first-person voice, this fictionalized book of memories of a real-life figure retells history through the eyes of a child -- from seeing mirrors for the first time and struggling with laughably complicated clothing to longing for family and a home she never forgets. Lush, full-color illustrations by Robert Byrd, plus archival photographs and documents, bring an extraordinary journey to life.